London, Belarus: Today the International Youth Federation Press Commission named Ms. Irene BOGUES as the new Head of Press Operations. "Ms. Irene is passionate about improving young people's lives, on top of that, dedicated to our goal of uniting youth and empowering them. She is selfless and believes that youth can make the world a better place." Said Ms. Gabriela Motroc, IYF Chair of Press Commission. 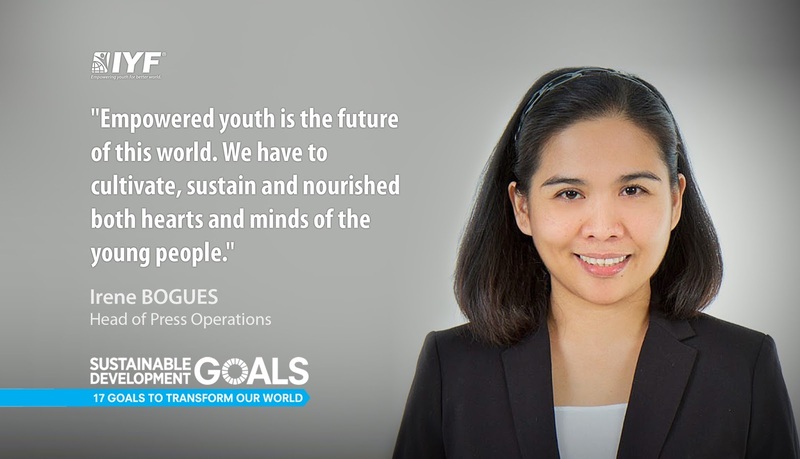 In a comment on her recent appointment, Ms. Bogues said: "Empowered youth is the future of this world. We have to cultivate, sustain and nourished both hearts and minds of the young people." Ms. Irene BOGUES is a young communications professional, strategist, web developer, content researcher and an impassioned social advocate, who believes that we’ve merely seen the initial swell of youth empowerment and activism, as young women and men and kids all over the world feel then exercise the power of their words and numbers, and that the best way to harness and focus the coming tide will be through the non-profit sector, with dedicated outreach and advocacy from organizations such as the International Youth Federation. Ms. Irene holds a Master’s degree in History from University of San Carlos.